Last night I went to bed and before falling asleep I felt this wave of energy and then went right to sleep and for the first time in days slept soundly thru the night without having to wake up and [be sick]. Whatever you did to help me I thank you big time because I feel a hundred percent better today and am even off to work in a few minutes! Anyway I am so glad to have your healing light in my life! There aren’t enough kind words in the English language to describe Ann. Her compassion is unparalleled and her dedication to bringing light and love into people’s lives is tremendously inspiring. The way I look at myself and my life has changed in a very positive way because of her gifts and guidance. She is truly a blessing. I stumbled on to Visions of Heaven at the perfect time of my spiritual journey. Shortly there after, I began getting my weekly messages from Ann and the Angels. Soon, I found that often times what ever was being said, fit to what was happening in my life at the time. I wrote to Ann and shared this with her. She responded back with such a warm and loving response I felt instant kinship with her. Funny, we discovered that we lived near one another when we were growing up. Last year I had a long distance private session with her. I have to say I was given a gift that day that I will always remember and forever treasure. Ann enlightened me with her friendly, fun style which I enjoyed tremendously. Additionally, Ann shared with me my father, who had recently passed. I felt as though I’d been touched by an angel. Ann truly is as much of an”angel ” as the angels who’s messages she’s sends out every week. I feel blessed to have been given such a beautiful gift. Ann, I have so much to thank you for. Your web site has given me lots to read and think about . But, more importantly it warms my heart when I am in need. I look forward to my weekly angel messages as they always give me good food for thought. Ann, thank you for touching so many lives with your warmth and love. I am very grateful to have been touched by an angel and her name is Ann Albers. Thank you for all you do and are. It is so appreciated. Your loving energy & gifts are amazingly healing & wonderful. The generosity of your truth and talents is so appreciated. I have read both of Ann’s books: “Bridging the Gap between Christianity and Mysticism,” and Love is the River.” They are both written with humor and grace. Her first book is helpful in clarifying that Mystical beliefs do not contradict Christianity in any way. They simply enhance it. Her 2nd book is wonderful for guiding readers on the path of acceptance, release and complete surrender and trust in God’s wisdom and care. Keep up the great work, Ann! I was blessed years ago to be able to have a session with Ann. Words cannot describe how empowering and uplifting Ann’s classes, personal sessions, cds and web site have impacted and changed my life. I will be forever grateful for having Ann in my life. I couldn’t be on this path without her help. Thank You Ann! Ann is plain and simply one of the most gifted and loving people on Earth. She speaks in profound yet practical ways to help you understand what your Angel guides want you to know. I have been seeing Ann for over 5 years and I consider my time with her to be enlightening and spiritually uplifting. Ann’s guidance has helped me tremendously and I recommend her to all of my friends. I would just like to thank Ann for her wonderful site and newsletters!… They have truly been a gift that has helped me feel normal, as well as not so alone, in the journey to enlightenment – one that can be so lonely on a human level. Her messages from the angels have delighted me as well as reinforced what I hear on a daily basis! Thank you for being there! Ann is a true messenger of God & a clear spokesperson for the angels and ascended masters. While many find the spiritual path as an escape from real life, Ann is facing life head on. Her ability to surrender to spirit despite of the usual human qualities, is an amazing experience to be part of. Ann is authentic, humble, and extremely gifted. If you have the opportunity to work with Ann, you will get inspired, get with a real sense of unconditional love, and who knows, you might be spoken to by angels too. Ann’s guidance and counseling have helped me keep my life on track for the past five years. Her sessions,workshops, and CDs have spurred my growth. Ann’s vision, insights, and wisdom are remarkable. After reading “Love is a River,” I purchased three more copies for gifts. It is so richly woven with poetic insights and common sense, I keep it close at hand. Ann Albers came into our lives nearly three years ago with her wonderful weekly Angel Messages. Since then her books, and her beautiful meditations have uplifted and inspired us here in Stavsnas Angel Centre, Wexford, Ireland. Thank you Ann so much. Ann’s note: Bernadette is now in spirit. She was an angel on earth and an angel in heaven now. She and I shared a bond of doing a “Celebration of World Angel Day” across the world from one another, nonetheless, connected always in spirit. We love you Bernadette! Ann is the most talented angel reader, clairvoyant, chairladient individual I have ever experienced. Her information has truly helped me access and be guided by my higher self. She is the most authentic and spirit-driven advisor, healer, medium, angel channel, and author and it’s important her work get out to the masses. What a joyful session! I have been smiling all afternoon! Ann is “the real deal”. Her readings have been right on. I have also attended a number of her classes and they have been life changing! A Spiritual Guru!!! You have been a life saver this year for me. through your gentle words, wisdom, and guidance I have been able to make sense of situations that would have done me in had I not been able to consult with you. I have absolutely no clue how I could ever thank you except by living the best life I can possibly live. Dear Ann, So many times your angel message has absolutely amazed me because it was talking about something that was occurring in my life that very week! The advice that the angels shared made me feel much better. I always look forward to email from you! Ann, You were the first kind, loving and true to your heart person I ever got to meet. Our sessions helped my immensely with my strength, acceptance of self, and understanding Angels more clearly. The cool thing is is the work we did was done with so much ease that I had know idea how much it helped me until a few yrs later, now! Sometimes something will be occurring in my life and a conversation we had then is applying to the situation I’m in now. How cool! Thanks for everything Ann. The very first time I worked with Ann an opening was created for the work I am destined to do. My abusive father showed up to apologize and beg forgiveness. Together we helped him to the light and I have been doing this work ever since. Ann is a powerful healer/teacher/mentor.She works with grace, compassion and tough love to move me in the right direction. She is a remarkable teacher, just the right amount of lecture, experiential, and deepening through meditation. I AM SO BLESSED TO HAVE THIS WONDERFUL ANGEL IN MY LIFE! I have participated in Ann’s Classes, Seminars and Personal One-on-One readings over the past 5 years, if not longer. Her sincere desire to be of help and service, coupled with her personal integrity, has proved priceless. No wonder the Angles speak through Ann. She has blessed and enriched my life each and every time. 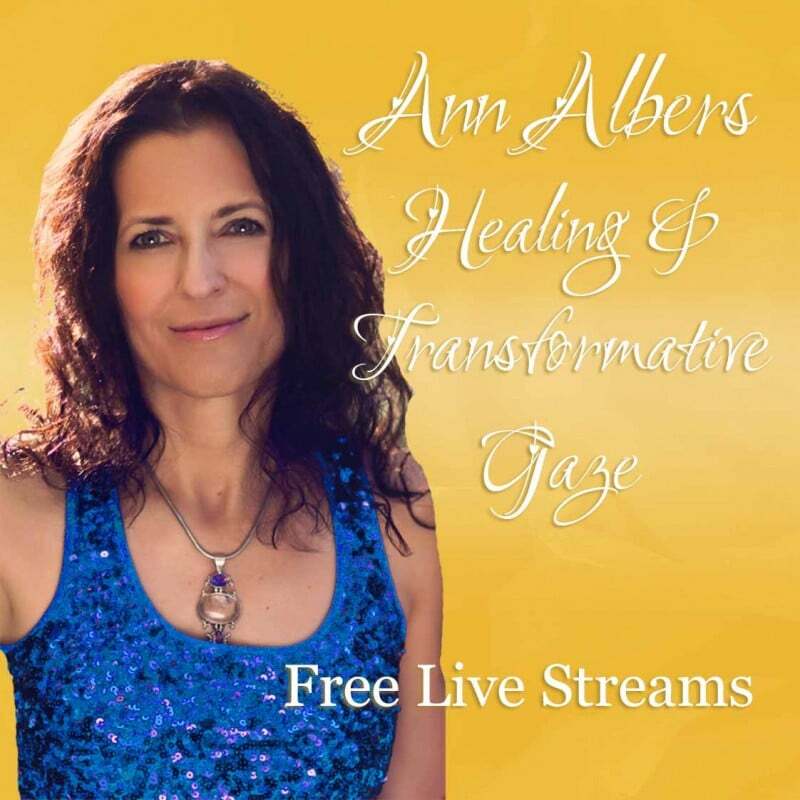 Ann Albers is always an a few steps ahead of the curve in this journey of life…her practical experience and wise advice are welcome guideposts along the way. Her messages and those of the Angels have helped me avoid many potential diversions…they have guided me joyously through good times and safely through times of crisis. God’s abundance of love, wisdom and wit come across through Ann whether in person, in her writing or in her CD’s. I consider myself truly blessed that our paths have connected. It is comforting to hear from our beloved angelic friends and know we are loved. The wisdom and compassion are always wanted. I appreciate your work so much. Thanks Ann. I wanted to thank you for your wonderful and enlightening seminar today. I thoroughly enjoyed it. I loved how you were able to site so many examples and stories to make all you said so relateable. The humor was appreciated too! The time flew by for me. I was also impressed with the center! Thank you again for a thought provoking, interesting and enjoyable time. I left feeling so wonderful – to live in the moment, that all things are possible and not to be afraid to trust (and ask!). Thank you, thank you! Dearest Angel Ann, As you know I am in Australia across the ocean from you and I have to say to all the globe that distance is no barrier to your healing , loving messages and support. There have been many times that my spirits were low and had lost my way and behold I open my emails and there you are, giving love and blessings in your beautiful sweet way that lifted my spirits and made my heart soar high to hear the voices of the Angels through you. Each week I look forward to bringing into my life the messages that you gift me from the Angels and also hearing your own stories of lessons that you have learnt along the way. Word’s cannot express how you have changed my life. For anyone who wishes to be wrapped in the wings of the Angels just listen to this wonderful woman and the wisdom she so freely shares .One day I will make it across the ocean to attend a workshop in person. Love and Blessings Susie across the ocean. I can’t begin or even come close to tell you about the many ways that Ann has changed my life for the better. Her classes, readings, and books have all inspired me to believe in myself and in the powers of Spirit. Reaching out to God and my Angels is as automatic to me as breathing now. Ann is so gentle and authentic, and always comes from LOVE. I just wanted to say hi and thank you. Without the weekly Angel letters, or knowing you are there, I don’t think I would have made it through this year as well as I did. By that I mean it reminds me of my spirituality and how I need to take time to meditate, do Reiki, and keep a calm loving outlook on life when times have been very challenging for myself and family. Although I haven’t been very visible to you, your weekly letters and your life experiences come to me and remind me of how much I need love/express love and God and spirituality in my life. I don’t even know where to begin! I met Ann “coincidently” about eight years ago. Knowing her has changed my life dramatically! She is a constant steady reminder of God’s love. I have had readings with her, attended classes, and learned Reiki. Her readings were so right on. It felt good to know what I felt was real! Knowing this has changed my life and gave me what I needed to flex my wings. Learning how work with my Angels and how to trust my intuition has changed my life! Ann’s Angels CD’s are easy to follow and provide a beautiful way in which to communicate and work with your angels. I have been very blessed with Ann’s presence in my life. When I reflect upon the beginning of my spiritual journey she is my beacon! I’m so thankful that my angels led me to your workshop back in 2008! I’ve been following you ever since & so look forward to Saturday’s when I can sit with you & the Angels & feel loved & inspired. I think I want to make this trip a yearly event!! Thank you Ann for being one of my Earth Angels & Guide. Your messages from the angels are like having a friend looking out for you. Much appreciated and very welcome. I can’t imagine how I managed without them. Thank you. Dear Ann, I live in Australia and therefore cannot attend any classes or workshops, but I enjoy your newsletter just for the Message from the Angels. I live alone and sometimes feel I need advice or guidance, just the contact with spirit, to let me know that I’m not walking this path alone. I’m sorry, but I scroll through your newsletter just to read the Message from the Angels, and every time it lifts me up and I feel supported and loved, and I feel renewed energy to give out that love in any small way I can during my day, a kind word, a smile, a compliment. Thank you so much Ann, and thank you so very much Angels and Guides. Ann and the Angels every week you bring so much joy and spiritual uplifting that you have touched my soul in many ways. In times of extreme pain or loss, Ann has a nurturing hand to be there with you. She does not take away your process of learning, rather comfort you along the way. When Katrina was coming, Ann did not say tell me to stay or go, rather she affirmed that I knew inside what to do and in all cases it would be right. I took this to mean everything would be fine, however, it was not – there was much pain and loss – but it was right in terms of the extreme insight and lessons I learned. It was right for me to stay for the storm, because I chose this place to do the work I have always wanted to do and had been working to perform. I was so inspired by Ann’s CD, Aura Hygiene. It helped settle me into a morning and evening short meditation. The meditation after- effects are energy, intuitiveness, and total awareness of the now in my life. I am so grateful for Ann’s coaching. I also love receiving her newsletter which is very inspiring to me. She is a shining example for me that it is possible to transform one’s life. Ann has been working with me for years now and my spiritual and emotional growth has been remarkable. When I first started with Ann (I call her my earth angel). I was experiencing emotional pain from loss and despair. With her caring and nurturing ways, Ann taught me that God is always there to support, guide and care for my needs. I know I would not be here today if it wasn’t for Ann’s love for what she does. I really enjoy reading the Message from the Angels every week. I seem to be very in tune – Today I made it a point to reschedule so that I could take time for myself and Ann wrote about the exact thing that I was planning on doing!!! I know it is the right thing to do!! Thank you always for sharing. I have known and worked with Ann Albers for over 7 years. She is strictly AMAZING!! She is ‘on the mark with her predictions and especially with her advice. Ann has replaced all my business advisors and coaches. If you are lucky enough to get an appointment with her, thank your lucky stars as it is better than money in the bank. Ann is amazing. Her books and seminars have changed my life in so many ways. She has helped me learn the confidence that I need to follow my own heart. She has such a sweet and pure spirit. When I went to see Ann, my heart was heavy. After working with her, it was light enough to fly. I have done healing bodywork and energy work for 22 years, and I also teach workshops on a national level. I connected with dear Ann about seven years ago and have spoken with her on the average of three or four times a year since then. It is impossible for me to convey how much help she and the sessions she has done for me have been to me. Ann is a person who truly walks her talk, and, allows everyone to watch as she grows, including her own challenging times on her path. In her sessions, she has provided the spiritual insight that I have direly needed into my own difficult situations and areas of needed growth. Ann rocks!!! Ann’s book Love is the River has been exactly what I needed in my life right now,…the message of surrendering,..and how to trust and allow life to happen have been so helpful and healing to me. I use the information constantly and refer back to it in times of need. The angels are always with us, and Ann helps me to remember this. Living in PA and having a home here in AZ. I heard about a reading while living in PA from a young lady that had a friend who decided to take his own life on his 21st birthday along with his partner at the same time so they would be together forever. This young lady contacted one of my best friends, the young man’s mother, and the rest is history. When we heard Ann’s tape from young Tim from the other side, it was like he was standing in front of us and telling his mother things about his life then and what it is now like on the other side. So many things said could only come from Tim NO ONE ELSE would have known the things that were on the tape. From that time on my search was to find Ann for just one reading in my lifetime. It took me 5 years to find her and meet her for the first time. I just had to see this person in my lifetime. Ann had no openings and sent me to several very good Psychics during her busy times. She is the real thing and since I met her took several of her classes and waited my turn for a reading as well as read and listen to many of her books and tapes. She has helped me through rough times of my as well as my daughter and grand daughter and for that I will never forget the good she has to share and help everyone in this lifetime. What can I say, I enjoy Ann’s messages from the Angels and I have read one of her books about Christianity and Spirituality, it really helped with questions I was having myself. I also want to add that when I have emailed her she is very prompt and she speaks to you as if she knows you. A very caring and angelic spirit!!! During a time when my life was at its lowest, Ann told me about the man I would meet who would be the man I prayed for. Also that ours lives would be happier than I could have even imagined. Two years later I met this man and in exactly how Ann stated we would meet. We have been married for 5 years and love the Brady Bunch effect it took on our family. Ann has helped me to listen to the angels and adhere to their guidance and help and realize I am not alone. She helped me talk to my Mom and my daughter after their passing. She helped me to believe. My life is happier because Ann helped me. I love you Ann. Thank you so much I will always be grateful to Ann. Paul says “THANK YOU!!! !” too. Dear Ann: You and the angels have been my inspiration for the last several years… Keep up the good work. Thank you Ann for being a clear channel to the realm of pure love that exists for all of us and for reminding me that it envelops me constantly and all I have to do is consciously resonate with it. Your classes, tapes books and sessions have served as a reminder for me of how loved we all are. I had searched and search for “my purpose”, never expecting to ever figure it all out. Ann asked if I had a question and her answer was the one I had waited for after 5 degrees and lots of roads. Ann, thanks so much for your choice to serve. Dear Ann & Angels, I get a lot of wisdom and answers in my life by receiving your messages.Thank you for being here. People ask me when I became aware of my spiritual journey. Ann Albers helped me open my heart in 1996 during her playshop, Meet Your Guardian Angel. Ever since then, she has been my spiritual counselor, friend and a beacon of light in my journey. Ann’s gift of love for humanity has a rippling effect, touching hearts worldwide. Thank you Ann, for touching mine. Ann is a sweet, playful spirit who helped me discover how much the angels loved me which helped me very much with learning to love myself enough to start taking care of me – not leaving myself till last. Ann Albers is gifted at creating practical, useful life “How To’s”, peppered with examples of life events and experiences we can all relate to, and shows us, that by asking for and listening to the angels guidance we can make shifts in our lives to heal, to love more, to forgive ourselves and others, and for me most of all, showing us how to honor and respect ourselves. I’ve taken a workshop, participated in an Angel Day conference, read most of her books, and listened to her CDs. Three things are constant about Ann and her work: 1. Real life events and experiences we can all relate to, and how by asking for guidance, and listening to the angels answers you can make shifts in your lives. 2. She is guided by her angels to share their love for us. Ann Albers is a shining example of a loving, caring, giving individual who has the courage to show us her struggles and accomplishments, to stand in the spotlight, sharing her life adventures with the angels. 3. By following Ann’s guidance you can make positive changes in your life. The biggest change, that has come from Ann’s work is to be loving to myself and to honor that I don’t always need to do things for other people. I realized that they need the opportunity to learn and grow as well. I need time to do what I want and what makes me happy. It’s ok to want and have quiet time, to read a book, to leap to my feet and dance around the house just for fun because then I am happier and it shows in my interaction with everyone. 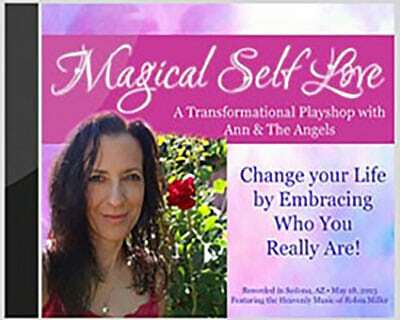 Take a workshop, read one of Ann’s books or listen to one of her topics on CD. Enjoy Ann’s perspectives on growing and healing. Thank you Ann for sharing your life with Planet Earth in such a large way. Thank you so much for the wonderful reading. It was great “nuts and bolts” advice for my business! Ann has helped so many people around the world, including myself. She has a special way of helping people bring their “true selves,” to the surface. Her books, classes, and Angel messages, truly are a gift from God. Thank you Ann! Ann is a treasure. She’s loving, compassionate, knowledgeable, supportive, encouraging, empowering, a perpetual student of life and has a quick whit to boot. I’ve had several private sessions with her, attended workshops she’s given and read her weekly newsletter. I know if Ann is presenting a workshop, writing a book or sharing her life experiences, it will be fun, interesting and informative. She radiates a love of life. Ann shares from her heart, sees with God’s eyes and has wonderful integrity. I particularly like the fact that she shares her own “lesson d’ jour” because it show how humble she is and how she, like the rest of us, is in a constant state of evolution. Ann’s open heart, non-judgmental mind, wonderful way of simplifying complex concepts and that wonderful laugh and smile of hers make her a true “gift from God.” She really does have “visions from heaven.” I’m an intuitive myself and, when I need a bit of coaching, I pick up the phone and make an appointment with Ann or sign up for one of her workshops. Just being in her energy lifts my spirits (no pun intended). WOW – I just want to say “Thanks” for an awesome reading yesterday! Let me just say how fun it was to finally do this with you. After meeting you years ago in Phoenix I bought your CD set MANIFESTING IN THE FLOW OF DIVINE GRACE which I have listened to over and over. I have loaned it to friends and also had you send a copy to my sister. I am so familiar with your voice and manner of speaking that yesterday was extremely comfortable from the get-go. I particularly love how much you laugh in your teachings and in the reading. You are truly blessed. I just can’t say enough to express my joy, but I’m pretty sure you’ll know. When I want to be calmed and I want reassurance that I am loved, I go to this web site for a feel-good session. Ann has been a wonderful and comforting source of Angel Wisdom and positive spiritual guidance. She somehow manages to do this while conveying her messages in a down to earth and human level method – even giving her own life experiences as examples which really helps to bring in a connection to us all and greater understanding of the bigger picture. She is an inspiration to me and I’ve searched long and hard for someone who was gifted and sincere in their efforts to enlighten and spread love, joy and peace of mind to others. I’d recommend Ann Albers counsel, books, CD’s, web site to anyone…and that isn’t just idle talk… I’ve referred many friends and colleagues who were in need of some spiritual guidance and light. Ann is the best and the world can use her sort of optimism and spiritual comfort and guidance especially now when Peace and Hope are needed everywhere we turn. I’m glad to write this testimonial because it comes from my heart with the only intention being to thank Ann and help others to find the guidance that I found through her work and her generosity. Thank you for everything. Thank you for the time you have taken to respond to my e-mail. Thank you for your supportive words in the e-mail. Thank you for all the loving energy you have sent. Thank you for creating a wonderful website. And thank you for being such a kind, accepting, non-judgemental person. Ann, I love you! Thank you for the work that you do, and who you are for all of us. No need to reply… I just wanted you to know how much you’re appreciated! Ann, I need to thank you for sharing your experiences. I am experiencing the same exact thing, and I have been feeling so alone and scared. Your words have been such a comfort and so incredibly timely. Thanks for being who you are and doing what you do. I have not been with you for very long. but it seems like when I read your messages from the angels and your message it’s just what i need to hear or understand. I’m sure you’ve heard this a million times but I just wanted to tell you I appreciate you! You are wonderful thank you. I am truly grateful. I just want to say how blessed we are to have you on the planet at this time. Bravo for your courage and tenacity to keep moving through the darkness. Each time you do it just brings more light to the planet and to all you touch. I for one am grateful for the work you do and share so freely. Thank you for keeping me in the loop and with the energy of the Angels. Ann is a dear friend and a very spiritual soul. She carries with her great wisdom and she has been blessed with the ability to share it in many different ways, and on many different levels. I have learned much from her books as well as her “Aura Hygiene CD”. Her Angel meditations are the greatest guided meditations I have ever had the pleasure of coming across and I use them regularly. If you have not yet had the pleasure of being in contact with Ann or of being touched by her works, I urge you to. You will not be disappointed, rather blessed. Ann was my first connection to this amazing life of light. Through Ann, Dr. Peebles confirmed my mission on Earth (this time!). I am eternally grateful to Ann for all the guidance and support. She is a beacon of love for all Light workers. I just wanted to thank you so much for the wonderful reading yesterday. You are so special and have such an amazing gift! My brother was so blown away with his reading and impressed by you, he has listened to his tape at least five or six times, it’s so cute. I hope you have a very Merry Christmas and a Happy New Year. I feel very thankful and fortunate to have met you and gotten the chance to have readings by you. Take care and be well, and I’ll see you soon. I so much enjoy your channeled messages as well as your human ones! Each teaches in its own unique ways! Thanks for your courage as well as dedication and passion to share these weekly messages of wisdom. I am honored to be a part of this community of “lightworkers” with you. I very much look forward to your weekly angel messages. All I can say, is: are you sure you aren’t specifically writing these for me?? I think you are!! Every week the message addresses EXACTLY the situation that is the focus of my life, be it: trying to obtain the job of my dreams, working through issues of loss for dear family members, challenging sibling issues, “tough days at work” issues, or most importantly so far, clearing my life of old habits, things, and people to make way for me and the truth that is me. I just wanted to take a minute to let you know how much I appreciate your work and your weekly messages, and to let you know how wide-spread your effect is. I just wanted to say thank you. Without the weekly Angel letters, or knowing you are there, I don’t think I would have made it through this year as well as I did. By that I mean they remind me of my spirituality and how I need to take time to meditate, do Reiki, and keep a calm loving outlook on life when times have been very challenging for myself and family. They remind me of how much I need love, God, and spirituality in my life… and to express love. If you hadn’t been there in the background reminding me, I’m not sure how I would have handled certain situations. So thank you Ann, you are a constant in my life. You’re a wonderful soul and human being, and I love you. First, let me thank you SO much for seeing us yesterday. I cannot tell you how much comfort and joy your message brought to me. I am at such peace since I saw you. I thank you for all the messages that you have received and shared. They have been very meaningful to me this past year and it has helped me move forward in my life. The sheer coincidence of many of the messages has been a real WOW and I have saved them to share with my Reiki group. I wish you all that is good but also all that you need. Hi Ann. I wanted to let you know how appreciative I am that you were able to fit me in and how beneficial I found our session to be. The messages from the angels concerning my marriage were more on target and helpful than the sessions I had with a therapist. Honestly! I really feel like I have closure now. You are a treasure, Ann Albers. God bless you. You have been one of the greatest gifts in my life! Because of you I see life in a completely different and wonderful way! There must be so many in our community who feel this way and I hope you know that. Every time your name is said in our house, it is said with respect, love, and admiration. Thank you Ann, for your role in facilitating this healing and for your support in helping me help others heal through doing the same work. Isn’t it wonderful being a witness to the healing that takes place in the people we serve? I cry tears of joy because of it! It was long over due and you were right, I am a natural. My heart is so open with love that I feel Jesus, Mother Mary and the Angels love for me in a way I never thought possible….24/7! Thank you so much for taking the time to talk with me. I miss my friend so much but you gave me the peace of mind and allowed her to let me know for sure that she is happy and free. I am so thankful for our gift and hope to develop my own. Ann! I’m am so very grateful that you put together the Aura Hygiene workshop. I’m amazed at the difference I feel within my heart, mind and body!! I feel stronger, more in touch. I’m overwhelmed right now and can’t find the exact words to convey what I’m feeling – I’m joyful and confident. I learned something extraordinary and I will never un-learn it. Thank you so much, Ann! I can’t thank you enough for being there for my and my family this weekend. It was a very scary time and you are so comforting. I’m not sure I deserve your blessings but i know you would remind me that is never true! My life changed immediately from the very day my dear friend, Diane, forwarded me an email from Ann and the Angels.Upon reading her messages, I purchased Ann’s book, Bridging the Gap between Mysticism and Christianity. Being a devoted Catholic, this was a big step for me. Since then, my circle of friends has expanded to include Hindus, Buddhists and Wiccans, etc. I have… signed up for weekly Psychic Development Circles, Shamanic Journey groups, monthly meditation groups, dolphin healing energy sessions and Mediumship classes to help lost souls cross over. This has all happened in the past year! Ann was the catalyst which brought out my true self one who is more connected to the spiritual world than the earthly world. Thank God and the universe for the messages of Earth angels like Ann! Thank you so much. Your gift has helped & healed us. Thank you for reminding me of my spiritual source. Thank you for this. And I cannot thank you enough for doing the work that you do. You have opened me to a whole new way of living — and I am so grateful. It was so wonderful to be in your energy and the energy of everyone at the workshop. During the first exercise the Angels showed me themselves encircling all of us. A first for me and so beautiful. I truly was in heaven all day yesterday. I need to spend more time in that kind of energy, it feels like home 🙂 Thank you for sharing Heaven with me, I am grateful. Thank you so much! It was wonderful meeting with you. Thank you for your light that was sent to the man who stole my car! I found him and my car driving down the road and the police were able to arrest him!! The power of angels, is amazing! Ann has been a light in my life for quite some time now. (years). A beacon if you will, guiding me along rocky shorelines into safe harbors. Her angel messages guide me the most. I have taken a class, a one on one session with her and a joint [healing] session with herself and Justin. All equally beneficial. Most recently Ann guided me with my 16yr old daughter whom is in much more pain than I could bear alone, so Ann offered her guidance there as well. I love Ann. She is truly an amazing woman with many gifts. I am honored to be a student and have taken numerous classes, including Reiki. Ann’s teachings have changed my life! She has taught me to view the world and myself through lenses of love. Her books and classes have taught me about judgment, surrender, and to embrace my gifts. Always without ego, She gave me permission to love myself and others fully and gave me tools to turn common sense into common practice. She is an angel! You were So well-spoken-clear and warm! I love your “practical spirituality” – clearly you are inspired and guided to help many people make sense of our life here!!! What a gift you have given me!! Words can’t express how completely grateful I am for the reading tonight. It was SPOT ON! I feel my son all around me and I feel almost giddy about how excited I am to have made such a beautiful, loving connection with him. It answered all my questions and I feel totally and completely relieved about everything. I’m SO relieved!! Ann, you are an angel. I can’t thank you enough for making room in your schedule for me. I feel such enormous, deep gratitude to you. There really aren’t words to thank you enough for the gift you have given me. Ann’s book, Love is the River: Learning to Live in the Flow of Divine Grace came into my life at a perfect time – Her gentle wisdom and guidance continues to encourage me to flow with my heart even when I have to challenge myself to go thru the difficulties change can bring – Ann has a remarkable way of steering without force, of showing without preaching, of loving without restraint. She is a genuine and wonderful soul and we are fortunate indeed to have her wisdom in our lives. I met Ann eight years ago when I was living in the Phoenix area. My first experience was a psychic reading that blew me away with its accuracy. I began going to her classes. A year later I learned that my husband was dying of cancer. He went quickly-only about 2 1/2 months after we learned of it. Ann was God’s gift to me during this time. She was my support while he was in the hospital and following his crossing over. I moved back across country to NC and later back to Georgia but I still talk to her by phone at least once a year. I miss her classes. I still use things I learned in them and now I get to enjoy her writing. I hope someday to be able to return to Phoenix for one of her classes or a seminar. Her weekly message from the angels always seems to hit home in some way. Her follow-up about how their message applies in her own life is an inspiration to me. I strive to judge people less, to go with the Spirit’s flow, to let God take care of things in his time and his way. My mother recently crossed over and I have communicated with her through Ann. Knowing that my loved ones live on and that they are still with me in spirit is a great comfort. Ann is both a great inspiration and comfort. I am so grateful for you and what you share with all of us. Your light is brilliant and warm. Thank YOU for coming to this earth and doing the work to find your purpose. You have brought me closer to the light and continue to do so. I have been always looking forward to your weekly angel message with your story. I just wanted you to know it has been a big big help for me and wanted to show how grateful I am that you chose this work following your heart. Sometimes, when I do not feel loved, I randomly read your past angel messages, and always made me feel better and always right on the point. Also, your stories helped a lot for me to understand angels message easier and really learn how to connect with God through your real stories. What a pleasure to receive your CDs on my birthday yesterday. I so wished for a message from my daughter who passed away a year and a half ago. That would make my birthday so special. I listened to Death Demystified first and then the Life After Death. The meditation to communicate with your loved one stirred my soul and I wanted to try to connect with her. It was a blessing to me to feel her presence while following your instructions. It was my desire to hear what she was doing “over there.” Imagine my surprise and delight when telepathically I got a message that she was helping and counseling women who had passed away or were nearing their transition. She said that these women had breast cancer. While Sheri was alive, she worked at one of the large hospitals in Salt Lake City as a mammographer! Your guided meditation worked beautifully and I thank you so much for the peace and comfort that you have given to me by showing the way to contact my daughter. Her sparkle, aliveness and beauty were breathtaking. God gave me a gift when he brought you into my life. The world is a better place because of you. I am so very grateful to you for all you do for me and my spirit. Thank you from the bottom of my heart and soul. I feel the weight of the world just lifted off my shoulders and I can smile. You are the BEST angel on this planet 🙂 I have the POWER!!! I’ve discovered Ann Albers to be the most remarkable psychic. She channels amazing connections, has insights past belief, and sincere credibility. Ann takes you immediately beyond any doubts, straight to the place you need to be. She’s able to step completely out of the way of Guidance, allowing that pure force through to you. I’ve never left a session with her without feeling connected to Truth. You are truly an earth angel. Your message is poignant and spoke directly to my heart. I took notes in my journal and I’m saving this one. Thank you! Your workshop last Saturday was life changing and lovefilled!! My husband and I enjoyed every minute! After almost a week of my son processing info from his appointment, I am seeing big changes in him! He has been talking non-stop over the last couple of days about everything you taught him! He has been “opening himself up” to people in a different way to feel their energy… So so cool to hear him speak with such confidence and knowing. I can’t thank you enough. Wow. I’m so glad you found me Ann, my smile has been taken off of the endangered species list. I don’t know what else to say except thanks…. I love your practical, down to earth, “can actually understand what this woman is talking about” style. I am so very grateful for the session yesterday. I feel utterly surrounded and supported today by angels I know have always been with me, but I have not been completely aware of their love and help. Now I just know it and feel it. I feel my brother here with me helping. It is such a wonderful feeling- I am comforted, reassured, feel loved. And being given permission to take care of my physical needs now was also a great gift. I have been blessed with terrific friends on this earth plane, but to understand the depth of support I have from the other side as well is astounding. Ann, I feel you and the angels have transformed me and my approach to my life. I have been on a spiritual path, as you know, but this just lifted me to a whole new level. So thank you, thank you, thank you for what you do and the beautiful soul you are! Thank you once again Ann for your newsletter. I cannot believe how much my life matches what the angels say! Hi Ann! I just wanted to thank you again for seeing me so quickly and helping me learn how to handle my new gift. I called my sister Saturday morning and told her that you’d said my grandfather was visiting me. Instead of dreading the dark and bedtime and trying not to think about it, I feel thrilled and excited! I don’t know what I’d do if I didn’t have you to talk to and get help and advice from. I know we don’t see you very often, but you are a very important part of my life. My spiritual beliefs and the things I teach my children are so different from just 10 years ago, and I owe all of that to you. You opened up a completely new and joyous way of looking at life and spirit and I’m very grateful to you! Thank you so much for the reading. It is a great gift you have. I just wanted to let you know that the work you do really does help people live better lives. Thank you for including me in your class today. I found it to be a very good learning experience, and I got some very specific verification that I can communicate with remarkable accuracy. I must say it was much better than I could have hoped for. I can’t tell you how amazed I am that everytime I am struggling with something your message from the angels is the exact answer I need. I am so grateful to you for passing these messages on. Thank you for the class yesterday. It was very inspiring. I received an email from a friend of mine with a lot of different people and events coming up. I had another friend of mine muscle test the email and she said I was suppose to go to your class! I look forward to more classes with you! You have a beautiful spirit and heart that truly shines thru you. God bless you and your family. You have a wonderful gift, not just in your channeling, but also in the ability to give the gift of peace for many people. Hello Angel Ann, Thank you for the most inspiring message on how we block God’s love… This is truly one of my big lessons, and I will carry your message with me forever. Thanks for sharing your experience with me. Ann’s note… Gary has since transitioned into heaven and it warms my heart to know this very dear soul is now feeling God’s love in every moment. Thank YOU Gary, so much, for your presence in my life. Ann!!!!! I am practically in tears reading your newsletter this week! This is one newsletter I will keep forever, as a reminder. But wow, I have never heard it put in such a way that I got it like I get this! Thank you, thank you, thank you!!! I just have this feeling like this message was meant for me. Thank you so much for your kind words. I feel like such a weight has been lifted from my heart and from my very soul. You are such an incredible gift in my life and have been such a comfort. You are truly an angel yourself. I appreciate your loving kindness more than you know. Ann, I just wanted to tell you how very much I enjoyed our session. Your inspiring words and encouragement meant alot to me and the confirmation was just what was needed. Thank you. I wanted you to know how much your “learning experience” of last week was enlightening to me. Thank you for sharing. I know when I read any channeled material it brings in that energy. The angels channel brought in some amzing energy and when I sat with my heart it was truly awesome. A very special thank you for seeing me yesterday. It still seems amazing to me that I actually was able to spend some time with you. It was a very important opportunity for me and you have been able to provide me with much that is helpful in sorting through all that has happened. Thank you. I am hopeful I will be able to meet with you again. Words can’t approach or convey… You, the angels and your reading changed my life forever yesterday. Eternally in gratitude. Thank you for the time and love you share with me via your newsletters. You are remarkable and having you and your messages from the Angels is a great help in keeping me on course. God Bless you! I just wanted to thank you so much for seeing my grandparents on Tuesday. You helped them more than you know. You allowed them to look at my dad’s death differently and it has changed their outlook tremendously in a positive way, and for that I will be forever grateful. One of the hardest parts of all of this is seeing them so upset and not being able to console them. You helped get them on a much better path. You are amazing, as usual. They are bringing me their tape to listen to tomorrow and I can’t wait to hear! Anyway, thank you again so much. I hope you are doing great. Talk to you soon. I just wanted to send you this note to thank you for the class on Monday evening. It was so wonderful. I had a feeling it would be but it was so incredibly healing it is hard to put it in to words. And with the magnitude of the subject and the amount of time you had to present, well I must say you did an incredible job! And you hit all the key points and gave us soooo much to think about. I know you must know the power of your message but I want confirm or validate that it is even triple what you imagine! I would like to first and foremost thank you for taking time to talk with me. I don’t know if you realized just how much you gave in that brief hour, but it was enormous to me! Everything you said was so encouraging and right on. Your accuracy and insight into things was absolutely amazing! If ever I had any doubts, I don’t anymore. I am only beginning to understand all this, and what a wonderful world is opening up to me, I am so grateful! Thank you so much for the work that you do!! Thank you for the reading. You are an angel that brings peace to this earth! Thank You Ann for all the love that you and the angels give to us. Dear Ann, I wanted to take the time to once again thank you for the most wonderful reading. I really cannot thank you enough. The reading touched me deeply inside and settled worries and concerns I held. My heart is lighter, my vision on some things clearer and I am grateful for my time spent with you. I thank God for giving you this gift and thankful to you for using it so wisely and lovingly. Thank you for your channeling abilities…. as well as what you’ve chosen to do with them. Your gift and your efforts are “lighting candles”… versus blowing them out in this universe which could create more darkness. I sincerely hope you realize and accept the positive influence you help manifest in others. Because of your reading, I now believe, whereas before, I am not so sure I did. I guess I THOUGHT I did, but now I know. I know FOR SURE. I just need to thank you again for such a wonderful hour. You really did change my life. I love you, Ann. You have helped me so much. Thank you, thank you, thank you for all the prayers. It’s working!!!! Once again you inspire my heart to soar to new heights.You raise my level of consciousness to be at one with God even in the darkest times. I have made a decision and wanted to share it with you as you are our Earth Angel and bring the messages from the heavens to light our way upon our path. I CHOOSE TO BE IN PERFECT HEALTH NOW. I had a fall on the stairs and instead of falling into the pain I stood up and said “I am healed by the divine love of God” and walked the rest of the way down the stairs. I figure that faith in God that cannot be wavered at any time can heal anything and this is my mission now, to heal myself completely and defy all test results and diagnosis. I have been a medicine woman in my past lives and will be again in this one and the beautiful thing is that I have the Angelic realm who loves me unconditionally. It hit me like a ton of bricks when I read your message today. I CAN DO IT AND I WILL DO IT!!!!!!!!!!!!!!!!!! Thank you for all your Love , support and caring this year , you have made such a difference in my world and given me courage to fly. Thank you so much! You and the angels put things into perspective for me, gave me hope and put me in touch with my own power. Dear Ann, You are such a joy! I think of the many ways you have given to me and the loved ones in my life I freshly realize what a blessing you are. I am so honored that you have come into my life and help me make sense of a lot of chaos.I thank you for your gift and also be so kind as to answer some of my emails with such strange questions. I know your time is valuable. Stay as beautiful and wonderful as you are in the year to come. You are a very bright star in this crazy, cosmic world. Hi Ann–I don’t know you and we’ll probably never meet, but I want to tell you how inspirational I find you (and the Angels) weekly messages. About a year ago a friend of mine suggested I sign up to receive them. So often, it just hits me right where I need it. In this busy life, your messages offer a moment when things can stand still around me. know that God has used you to bring me into truth.Thank you for the love. I now remember how God loves us All so much. I asked for God to help me understand the truth and he used you to bring me an answer! I get it! In the name of God, Jesus and the Holy spirit! God is love! God Bless you ANN! Thank you so much for all your words. I have re-read them all day. Thank you so much for meeting with me. You don’t even understand how much it meant to me. You really helped me work through my fears. I still have a long way to go but I very willing to work on it. Please pass on any classes you will be teach or feel that would be good for me. I just feel such a connection to you, I can’t describe it. You are truly a miracle worker, and I trust your honest opinion. The messages you send through your letters have given me so much to sustain my spirit. I cannot thank GOD and the Angels enough for your gift. I usually don’t respond to your Weekly Angel Readings. However, today when I was about to delete this email… after reading it several times and feeling the love… my Angels spoke to me and said “tell her how you feel, let her know she is loved, and appreciated”. You are all of that an more, Ann. Thank you for going out on a limb for all of us who so desperately and sincerely need to have you speak to us. I listen and read your words through my heart. I have never felt, nor heard, in my heart anything but love, compassion, understanding, joy, peace and harmony from your sweet, gentle, loving voice. Be it in person or on the printed page. God Bless you for what you are doing and the brave soul you are to share it with us all. Thank you for the strengt and support that you and the angels have given me in 2006.It made me stronger and peaceful from the inside and above all it gave me the confidence to love others more. Also I can let love come my way easier because I am worth it for who I am. I can now feel the love deep inside of me. It took a very long time to find my way back to this beautiful energy-giving feeling. I learned by your messages to focus at what I have in my life and not what I do not have. That’s the greatest gift and lesson that I have learned form you and the Angels last few years through your messages. I hope you can understand my English, forgive me if I express my self wrong. I wish you all the best for the new coming year in very good health. I just want to say Thank You for what an inspiration you are and what a wonderful job that you did yesterday with the Seminar. My friend and I got so much out of it and felt excited, happy and energetic when we left. It’s hard for me to express just how good it made me feel…but it was GREAT !!! My fingertips felt all tingly like they did the day I had my reading with you. THANK YOU for all you do and for just being you..true to yourself!! Hello! It has been over a month now that we attended your Be-lightful Playshop Thank you. I was never so comfortable in a Playshop as I was yours. The energy was amazing. My friend said outloud “she is mesmerizing” just as I was thinking it. We have all benefited and are incorporating the information from that days play!!! Wonderful things …I am so grateful for you stepping out and spreading THE messages from the Angels and making it a Blooming Event for all of us !!!!!!!!!!!!!!!!!! I just wanted to take a minute to thank you for the beautiful day you created yesterday with your workshop in Sedona. Simply amazing!! I loved every moment of it. The space, the day; gorgeous beyond belief! Crystal blue skys, brilliant sun, and light winds rustling in the trees. A perfect backdrop for the transformational space you created with us. And Robin Miller’s music was truly inspiring. How special to have him there, playing his music and sharing in our journey. What a total delight!! Thank you, thank you, thank you. It was simply perfect. Yeah Ann!!! You really did a phenomenal job today! My friend and I thoroughly enjoyed the entire event! Thank you, thank you, thank you!! We needed that!!! Hi…I just want to say Thank You for what an inspiration you are and what a wonderful job that you did yesterday with the Seminar. My friend and I got so much out of it and felt excited, happy and energetic when we left. Its hard for me to express just how good it made me feel, but it was GREAT! My fingertips felt all tingly like they did the day I had my reading with you! THANK YOU for all you do, and for just being you– true to yourself! Love you! I want to let you know that your CD on “Aura Hygiene” is just magnificent. It is the best resource I’ve found to deal with the “energy drains” and I think that you are doing important work, on the cutting edge. You have a very good style on audio and you’re a great teacher. Thanks SO much for all the good guidance. I feel very blessed to have you as a teacher! I LOVED your workshop! You are so amazing in so many ways. You’re a true role model for me. I read your book cover to cover on the rest of my trip and loved it. Thanks! Hi Angel Ann, I can’t thank you enough for your session with me on Thurs. It was one of the most revealing, beautiful, comforting, sweet, loving, fun, wonderful experiences I’ve ever had. My goodness girl, how do you DO that??? Bless you for following your heart and for sharing your love and knowledge with all of us who are stumbling around out there, searching for the right path. I learned so much and feel truly blessed. Ann, thank you sincerely. It was lovely to meet you and I appreciate your compasssion and concern. Had I not spent most of the session either crying or with my mouth hanging open, it would have been a real hoot to spend the time with you! Whenever we have a session next, I would be more than happy to have your dogs join us if they (you) would like during the reading! Dear Ann, the Angel who wrote this piece. You are amazing and I am thankful to God that you are allowing your energy and gift to feed me these messages which are so timely. Thank you reminding me to rest and allow the light of God to show itself through me. It is amazing to me that you don’t know what it is I am going through, but can write something such as this and be on it girl friend. I pray for you that all will continue to be well with you and that all the needs in your life will be supplied. Thank you so very much. BE tremendously BLESSED! You are an amazing gift from God. You bless so many people every day. I just wanted to thank you from the bottom of my heart! I’m listening to you right now on Coast To Coast and every word you’re speaking resonates with the deepest core of who I am. Thank you for this gentle wake up – I really needed to hear you speak. Hi Ann, I just had to write to you this morning and say how totally awesome you were last night on Coast to Coast. I especially loved all the analogies you used to explain the things you were speaking of. I just thoroughly enjoyed it and didn’t even mind the am hour – I thought you were brilliant, human, and so REAL. The way you responded to the man who called in about your walking a thin line was with love as of course you would do. I think George really enjoyed talking to you also! I am so grateful for you and what you share with all of us. Your light is brilliant and warm. Thank YOU for coming to this earth and doing the work to find your purpose – you have brought me closer to the light and continue to do so. You did a fantastic job on your interview with George Noory on Coast to Coast. I stayed up to listen to the entire interview and it was terrific! It was very much like a conversation and you were you… absolutely genuine, which was the best of all! You handled the caller with the heresy problem just beautifully, which sooo much grace.Keep shining the light and doing the great inspirational work…. you are very much appreciated! I heard you on Coast 2 Coast and you are precious! It was one of the best interviews in the history of that wonderful program, and I’ve been a listener for many years. I learned so much and it was presented fun, positive attitude. Your a gift Ann. Thanks for what you do to enlighten the masses. I love hearing what the angels say in your weekly newsletter. However, your personal message after the angels is something that I look forward to reading. Your “humanness” puts things in perspective. You have such a gift for writing. You can take an average day for yourself and write words that illustrate the emotions you felt after something happened that day. You are able to bring the lesson you learned from your experiences into the reader’s world.Seeing how you handled a situation is helpful to me in understanding how to dig deeper for the meaning of my experiences. The picture you “paint” in my mind as you write, helps me to look at my own day to day occurrences. It assists me in understanding that each event carries a lesson if one will just look. I am still “floating” from my experience last weekend! I’m totally enjoying a feeling of freedom or centeredness. It is hard to describe but wonderful to carry inside. Your joy and trust in God is contagious. Your power and love radiate from you so naturally. Your humor, combined with channeled information is priceless! Thank you for the experience. Ann, I am still digesting my wonderful experience meeting you. I find myself smiling and feeling happy knowing my parents are happy and together. It is amazing how stuck I became in all the battles and judgements I have carried. I do love them both tremdiously and now am looking at many little things differently.Each day brings a new joy and my old fears are there for me to look at and realize I don’t have to cling to anything except divine spirit. Wow, what a relief. With your wonderful gifts I can see, be, and feel my authentic self. Dear Ann, After your reading, peace and calm was restored to my soul. Do you know how many people you help through me????? OMG… You are so dear and so helpfull in any situation, I wish you were my sister. You see me like no other, as though I was PERFECT! You help me believe in myself, you are a true blessing to ME, Thank you for allowing me in your life. I LOVE your Be-lightful Playshop. I feel so much lighter and joyous now. You have such a positive, loving, funny way of looking at the things we humans stay attached to and for example, the Ann Albers getting rid of guilt mantra not only works but it is a hoot to do. It is like as an adult ordering the monsters out from under their bed. It kind of makes you giggle the more you do it. And you lighten up. I was a little bit surprised about how quickly you moved through the guided meditations as I am used to something slower, but now I realize you were doing it at just the right speed needed for everyone and I realized that I don’t need to slog through meditations, trying to imagine this or that, I just say ok, a ball of rose light and move on. You have really grown and expanded as a speaker and nowhere is that more evident than in your “Being Light in Oneness” meditation. You expressed the idea of the grid and how to travel on it so well that men and women relate to it and I personally found it very easy to do. You have such a timely quality in the images you get us to see and follow when you do the meditations and I suspect that if you are guiding the same meditation 10 years from now, your images and examples will reflect the timeliness of images and ideas from then. I can’t tell you how much I enjoyed our meeting yesterday. I loved meeting you and experiencing your energy and the fun & love of the angels that brilliantly shined through you. I think I floated the night away. I’ve never experienced so much peace and grandeur all at the same time. Thank you for giving me that gift and letting me open to it – what a joy to experience for the rest of my life. To tell you how much knowing you has enriched my life and that I have felt so blessed by your friendship. Love U.
Ann’s note: Mike is a delightful lady, now in heaven who used to come talk to her husband, also in heaven, through me. Now they are in paradise together! I just wanted to send you a short email to tell you I’ve enjoyed reading your posts for over a year now. Your courage to listen to your heart and angels has helped me to do the same as well. I receive the same messages of love and inspiration from my angels and to witness another’s journey, helps me to validate my own experiences. It has also helped to bring me time and time again back to my center and in the loving arms of my Creator. Thank you, thank you for sharing your inner spirit with all of us. Thank you for sharing your kindness with your weekly messages from the Angels. Also for sharing your words of wisdom when I was seeking answers. You are a light amidst the darkness! Now, that’s a message that should be published in every local newspaper around the world! Although I haven’t seen you in a while, I will never forget the energy and powerful way you carried yourself when I first meant you Ann. The way you allowed spirit to flow the light and energy through you was so amazing to me. You had gained so much trust in yourself and in spirit to allow yourself to step aside and surrender and I found it truly an accomplishment and a great service to others. That vibration stays with me today, it was such a wonderful gift to be in your energy and to attune myself with it. Thank you for being who you are. Dear Ann, I want to let you know how much I enjoy your newsletters. The messages from you and the angels are so full of wisdom and love. I think it is wonderful the way you have built up and connected the spiritual community in your area. As a healer/channel in Hong Kong where the spiritual community is very small and work sometimes slow, I receive so much inspiration from you. Although I always read your emails eagerly, this one has truly resonated with me. Just wanted to say – may all that love that you spread come tenfold back to you. You are an angel! Hi Ann, I just wanted to say how much I appreciate your weekly messages. I’ve been getting them for several years now and they’ve been very meaningful for me. It is such a joy to be able experience through your honesty how God is working in the “real” world with a “regular” person! In reading about your personal walk with God and the Angles I feel as though I’m glimpsing a spiritual diary. Please don’t take this the wrong way, but its almost as if I’m watching a Saint in the making. After all, what is a Saint if not someone who is choosing to walk closley with God every day. You are giving the world a great gift. Thank you! Thank you so much for taking the time to speak with me and my sister yesterday. I can’t tell you how much doing so, has helped us. We both felt amazing and even better today. We feel the release of the pain that we’ve been holding onto for over 6 months now. I believe you actually met my Dad, the love of my life and I feel so blessed to have gotten such loving messages from him yesterday. What you do, your gift….it’s priceless. My emotions took over a few times, and it was hard to speak. I want to thank you SO much for that very special gift. You have no idea how much that means to me. I am going to have to process all of this, and I really look forward to receiving the CD. I would also like to ask if sometime you would be willing to do another session. I feel like I want to say some things to those I love who are no longer here, but I need to be able to not be choked up. God bless you, and I am so grateful to him for giving such a gift to share. Do you know how much I love you? I lean over and kiss your cheek right smack on my computer screen sometimes!!! Your presence in my life is THE most DIVINE blessing I can imagine. Thank you soooooo much for being here with me. Hi Ann, Just wanted to let you know how much we loved the workshop! You are an amazing speaker and held us in your “spell” throughout the day. The energy in the room was amazing, particularly at the end when we all hugged our new friends – both human and spirit! Your pure, simple and heartful words and stories never fail to speak to me. Deeply. Thank you, dear angel. I wanted to let you know that I’ve just finished listening to your Be-Lightful! CDs, and I love, love, love, love, love them! There were so many little moments where I felt such bliss that I was moved to tears… while I was already familiar with much of the material you discussed, you presented it in such a joyful way and made it so much more fun. Thank you so much for doing the work you’re doing on God’s behalf – it’s truly inspiring, and it’s made me realize that it’s time to bring my own light out of hiding. I don’t know if you will get to read this bu I just wanted to say a huge thank you for the work you do and the messages you share. I only recently came upon your website and I find your writings incredibly refreshing and helpful. In these days of a sea of email transmissions, I can honestly say for some reason yours stands out…….loved this latest sharing and given me much food for thought!! Thanks again for a wonderful session. You are so great, thanks for sharing your love and light!!!! I feel so much better. Just wanted to comment on one of your recent readings. My cousin just got together with you this last Friday. She called me to let me know that you detected the presence of my late mother. From the message you gave her I just knew my Mom was in a better place and not suffering anymore from her cancer. The details you provided could have only been known by close family members. Thank you for your message, it really means alot to know my mother is doing just fine. I was with her when she passed and I felt very happy for her instead of sadness. I knew then that she was going to be just fine and that I would look forward to seeing her again someday. Thank you again for your gifted connection. Ann, Thanks for helping my daughter yesterday! She went home last night, followed the angels’ advice, and baked cookies for the little ring leader bully at school. It made perfect sense to her and it went perfectly. I think it was a little reset button in that child’s brain because the bully didnt know what to think. After school she posted on facebook and thanked my daughter. Thanks again she seems much happier today. I even had to ask them to “back off” a bit, as my energy was a little too “spacey”, which they did do. I guess I want to thank you for not being another weirdo new age person, but just a neat woman who happens to talk to angels. I felt you presented very practical information, too. I have also had some good new insights into my own psyche since Satuday, maybe coincidence, maybe not. I don’t know how I would have made it through the past year without you. I can’t thank you enough.today was an amazing experience. I’m looking forward to listening to the recording. After we got off the phone I did what you and the angels advised and I laid down and closed my eyes and asked to be comforted and loved. At work tonight one of my employees who is very sweet and has been concerned about me said I looked different tonight, that I looked good and I realized that I’m feeling a little lighter and less sad and it’s already showing. Thank you and Thank you to the Angels so very much. I feel very loved and safe and I am so grateful. I know I’m not through grieving yet but for the first time in weeks I believe in the light at the end of the tunnel even though I can’t see it yet. And I’m excited about the next year and what adventures will come. Dear Ann, I feel so much joy, it’s unbelievable! Thank you so much for your help and encouragement, I feel like it was such a blessing to talk to you that day. I think my father in law truly did want to connect with me and sent me to you first because he knew you would be honest and up front with me. Thank you so much for the calling me yesterday. It helped me so much. You are a blessing to every life you touch. Thank you for helping my friend! As soon as he hung up with you today, he called me in tears of joy. I knew that his talk with you would be amazing. This was his first experience of this kind and I’m so happy it was with you. I’m sure you hear this all the time, but, what you do matters so much! You have given him so much peace, it’s unbelievable. I know that you are the conduit, but if it wasn’t for you, the messages wouldn’t get through. I thank you from the bottom of my heart for that and I feel so honored and blessed to have you, a real live angel, as a friend. You totally hit a home run with my father in law and his friend today. Oh my were they impressed with your gift! You rocked and changed their world today, for sure. You are such an amazing person, Ann. I just want to acknowledge that the way you treat people and share your gift with them is so honoring for all, and brings great peace of mind. I feel blessed to know you. Hi Ann! What a wonderful weekend! You are a great teacher and my friend and I felt so uplifted and overjoyed after attending. Thank you Ann! I was in to see you a couple of weeks ago wishing to communicate with my murdered son, who was taken away from me last year. The first session I had with you, he promised to always be around and with me, yet I could never feel his presence. That all changed just a few weeks ago, after our second reading, where we asked him to try to make his presence known to me, for I missed him so very much it was causing me much pain and unhappiness. Well, the advice you gave him and myself seemed to work, because I had the most wonderful dream of him where I actually got to hold him again and tell him how much I loved him and how much I missed him! I can remember every little detail of this dream including his touch, his smile, the sound of his voice when he told me, ” I love you to Mom!” It was the best dream of my life and has made my pain so much easier to live with. It was exactly what I asked for and needed. Thank you, wonderful Ann Albers, for such a priceless gift! You are a true humanitarian and make me proud, for once, to be part of the human race. You gave my son the direction he needed to communicate with me and after just a couple weeks, he learned enough to come to me and make his presence aware to me and we had a GREAT reuniting that I needed so badly. I’m hoping for many more to come. I remember everything about the dream and I know it was real, and that it was actually my beloved son. You gave him instruction on how to communicate with me so I could feel and remember being with him, and he must have listened well, because within a couple of weeks we were reunited. THANK YOU. YOU ARE SUCH A LOVING WOMAN AND A TRUE HUMANITARIAN. GOD BLESS YOU! You are a blessing & a delight – no coincidence there, eh? As I count my blessings, & all I have to be grateful for, you are high on my list. You have made a profound difference in my life, & I truly treasure your many kindnesses, readings, meditations, & care. Feel the Angel’s patting you on your back, because I’m sure all of ours are doing the same thing… You make their job way easier! I just wanted to write you a note to say thank you for your great book (Love is the River)! I am getting so much out of it! It’s as if I am waking up to a whole new world of beautiful sights, sounds, colors and sensations. A whole new way of perceiving my world really. I can close my eyes and practice the breathing and sensing exercises that you recommend, then before I know it, I am so caught up in the beauty of the sights and sensations that before I realize it more than an hour will have passed and it only felt like a few minutes. The peace feels so amazing and the vibrate colors and sensations are so beautiful! Better than any picture I’ve ever laid eyes on. I have spent the last couple of weeks just with the sensing exercises in chapter 2. I don’t want to rush through it, so I am just taking my time and allowing myself to sense when it’s time to move to the next step. Thank you so much for putting pen to paper. This work in a tremendous blessing! Hi Ann. I wanted to thank you for your wonderful and enlightening seminar today. I thoroughly enjoyed it. I loved how you were able to cite so many examples and stories to make everything you said so relateable. The humor was appreciated too! The time flew by for me. I thank you again for a thought provoking, interesting and enjoyable time. I left feeling so wonderful – to live in the moment, that all things are possible, and not to be afraid to trust (and ask! )… Thank you, thank you! Thank you for helping me with this process. Thank you for helping me dig down deep & renewing my faith in God. Thank you for helping me understand the concept of taking back one’s “power.” This has been a life long process – but I feel like you turned a light bulb on. Thank you for keeping people (myself included) connected to God and connected to that Love. I’m still learning to communicate with God/angels without tearing my hair out. You speak Heaven’s language very well – your CD’s/downloads/words of advice are like a spiritual Rosetta Stone. I did a reading with you back in late August/September and in the reading you were telling me about this little boy who was waiting patiently to come down and be my son! I remember you said that my first child would definitely be a boy, that he wouldn’t break through birth control, but that once we were ready for him he’d come right away – that he is going to be a really happy, active boy. So far everything has happened just as you said! I got pregnant in November, the first month that I was off the pill, and now this week I found out that the baby is a boy and 100% healthy! I am so thrilled! Hearing about him from you back in the fall definitley made me much more excited, and made me want to meet this little guy as soon as possible!! I’m attaching a picture of the ultrasound so you can see how perfect he is!! I’ve listened to your Read Your Money CD twice! It’s great to hear your voice. You definitely capture the audience with your lesson. This was a great idea! I’m forwarding it on to my friends! Thanks again for helping to “access” my son. I can’t tell you how much more peaceful I feel. I don’t feel so lost and alone (part of my lessons). My son on this plane was just as incredible. He has left such a void in many lives. But he also taught us alot about living. Thanks so much again. Thanks for the reading the other day Ann. It was very helpful. I am glad we crossed paths, very, very glad…Thanks for doing what you do. It’scourageous and an incredible act of love for the world. I was thinking of you and thought I’ve never told you that and wanted to. So, thank you. Thank you for getting me closer to God. I love you for that. You’re an angel to me. You really did a phenomenal job today! My friend and I thoroughly enjoyed the entire event! Thank you, thank you, thank you… we needed that!!! P.S. Can’t wait for you to put the CD out. Count me in for at least four copies! I just wanted to thank you so much for the wonderful reading yesterday. You are so special and have such an amazing gift! My brother was so blown away with his reading and impressed by you, he has listened to his tape at least five or six times, it’s so cute. Every time I take your class I am more evolved. I had all amazing experiences. Not one, but two readings, 1 year apart, for my husband and I, and Ann soooo confirmed that which I already felt and knew!! Ann is so spot on and it’s pretty amazing, even when I understand the Laws of the Universe. She has the most fun and wonderful personality and a 30 minute reading is packed with at least 60 to 90 minutes worth of information. I highly recommend not to waste any time and get lined up for a Rocket full of Love and Confirmation or New ideas for your Life! Thank you again for your help, Ann; it is wonderful and comforting and always helpful, and we are all so very blessed to have you in our lives! Ann, you are truly an angel on this Earth. You give and give and give more! We are so blessed that you are here! I want you to know how much I gained from my session last Thursday. I feel like I know myself now like never before. And it gave me hope – no, not hope, belief – that all will turn out for the best. Everything you (and my angels) said made sense, and it’s great to be able to listen to the tape and have it all reinforced. I feel uplifted every time I listen to it. So now I am celebrating what I had/have with L, while at the same time remembering that I want (and will have!) more, on a human level. My heart still hurts, but I know I’ll survive. Thank you for facilitating my survival! Your encouragement and reassurance mean so much to me. Dear Ann, I just finished my wonderful journey with the Angels after downloading your Date With The Angels. Loved every minute of it and many tears were spilled. Was my heart spilling over or was the whole experience so joyous that they were tears of joy? Have listed to Manifesting in the Divine Flow and absolutely LOVED it!!! Since I can’t attend your seminars (due to logistics) this made me feel like I was still part of your circle of friends. The CD was so helpful and concise that I learned how to incorporate new tools and thoughts into my life. THANKS for sharing your voice and heart. Tracy and I cannot stop talking about this seminar (Be-Lightful)…it was SO AWESOME…so much more than we expected and totally reached out to touch that part of us that needed touching.l We are so blessed and lucky to have you in our lives and the world is blessed that you remember you and are willing to share with us. You are AWESome and we love you so much. Thank you again. It was like I know you forever and made me feel so important. I’m so grateful and happy. Deep inside my heart it is SOMETHING more than love and gratitude when I think of You, my whole being gets lit up…words are poor…Thank you, much love. Hi Ann, I just wanted to thank you for an awesome day at Be-Lightful! You were incredible. I do so love your sense of humor! Thank you for sharing your beautiful self! Just wanted you to know how much I look forward to your emails and inspiration each week. Not only are the angels’ messages inspiring, but your personal messages are very helpful to me. Your comments helped me to see how to apply the angels’ message to life’s everday turmoils that arise and look at them in a totally different way AND with a sense of humor. Thank you, thank you for the time and effort you spend in reaching out to so many people and making a difference. I just wanted to write and tell you that I have listened to your cds four times. I am painting the one side of our duplex and we are either going to sell it or rent it out but I have enjoyed the whole progect because of your cds. What a joy to plug into your pure, happy voice and funny stories and truths. It makes me look forward to my days, I am learning so much and I feel that the lessons have gone deeper and deeper within me. You make manifesting so much more fun to me. I have known the secret like we all have for a long time but I never wanted things as much as wanting to have God in my life guiding me and directing me as you are teaching. You also helped take care of the “I have so much I shouldn’t ask for more” and also “does God really want to give me what I desire and more. ?” I prefer to ask God for the basics as you have said because I don’t know what I really do want and I think that is why I have never worked to manifest it. To be ONE with the Divine energy all the time, to be happy, healthy, abundant and etc. and to know that he knows what will make me so much happier then I could even conceive of. Yours is the best cd on manifesting I have heard. It is you being totally you that brings innocence, humaness and angelic joy into the essence of it. Thank you Ann for being such a wonderful spiritual teacher and also for your readings in which my son can come through in teasing ways. Ann, your teachings continue to crack the concrete around my heart. I want to thank you again so much for the reading today. You have changed my life for the better, you have an amazing gift. I no longer have such a fear of death. Your message from the Angels was written brilliantly. It is truly amazing that what you wrote was exactly what I have been experiencing. You are an inspiration that cannot be expressed in words. You cannot even comprehend the depth of your benevolence, sweetness, light, love, laughter, inspiration, playfulness, wisdom, and grace. We connect with those parts of you and we are so grateful for your benevolence. I LOVE YOU !!! Just wanted to write and tell you 🙂 My sister and I met you at the party for the Redfields after the opening of The Celestine Prophecy movie. We were in the group of 8 or so who closed out the evening staying late and relishing the experience. I pop in to your website every so often and it is always inspiring. The other day however I was pulled to log on and I found your CD set Manifesting in the Flow of Grace. I hesitated thinking I couldn’t afford it right now and then realized that was fear talking and I should listen to the feeling telling me to buy it. So I did. Absolutely Fabulous!! I LOVE YOU, I LOVE YOU, I LOVE YOU. What more can I say? When I listen to the CD’s I actually feel your energy filling my body. I have been growing all my life but specifically more so in the last few years (getting back to my spiritual roots). You are the tipping point. I am overflowing with JOY in the NOW with SPIRIT. Please thank the angels for me and all my thanks to you too. I am currently sharing the CD’s with a good friend and plan to pass it on to another when she’s done with it. I know I will see you again someday in person. I wanted to tell you how much my husband and I enjoyed your Be-lightful workshop. I have attended 2 of your other workshops and knew I was in for a great day, I was not disappointed. A dear friend in Germany told me about you, your newsletter, and your work. So I subscribed to your newsletter just a little while back. Ever since then, I’ve been intending to write you. I love your newsletter, and your website. They reflect such powerfully loving energy which, I’m sure, is a reflection of who you are. Your messages are so uplifting and practical. I also love the way you share about your personal life, the challenges, the joy — all of it. You have a real gift, and I’m sure you touch many people in many ways. There’s so much information coming out these days that is not uplifting or positive, even among some of the “new age” community. But the messages that really stand out, at least for me, are those that inspire, uplift, and empower us. People in our world today need more of those kinds of messages. Thank you for providing that for all of us. I wanted to thank you for the incredible experience last week. I didn’t know what to expect but it was a delightful experience. I so enjoyed you and your awesome ability to be a “conduit” of the ascended masters. I am still processing the information and feel the session opened doors for me. I also feel that I received gifts from the angels. Thank you so much for the “Angel Reading.” I learned more from the reading about how to change my life than from eight weeks of watching Oprah and Echart Tolle. What a pleasant surprise to find you on the Coast to Coast website. Many years ago you gave me an incredible reading that communicated valuable, healing, much needed perspective on a life event of mine. Thank you so much. You are doing amazing work. All the best! I wanted to thank you for all the beautiful messages, photos and peace filled words on both social media and email that you have provided. I have been following your’ work’ for some time now. The gentle reminders you provide through nature pictures and encouraging words is a blessing to me every day. I want you to know how much your work means to me. I wanted to thank you for you kindness toward my mother. You fit her in for a reading in December when we found out that she had terminal cancer. You also took the time to answer a couple of email questions that she had. My mom passed away yesterday morning thereby completing her life on earth and moving onto the next stage. Thank you. My life is so Blessed since I first met you. You were able to show me the way and God and his Angels have been so good to me. I cannot thank you enough for all that you have done for me. I was once lost and now I am found.. I just got finished listening to the recording of our session and I just needed to stop and thank you again. The amount of time and angst that you have saved me is staggering to me when I think about it. I am able to let go of things that might otherwise haunt me for life, I gain clarity on people and situations that might take years for me to get to on my own, and thanks to you, I have my beloved father and Baba in my life in a way that I couldn’t otherwise. You defend me against my worst self-doubts, you give me a positive perspective on my life no one else has, and you patiently put up with my anxious ramblings (which makes me crazy to listen to when I play back the recordings—forgive me!). It occurs to me that it would be easy to assume that because you shed light on my life so easily and gracefully, that your own life must just be roses all the time, which of course can’t be true. I can only guess what it took for you to come to terms with your gift and the sense of isolation you might have felt along the way. Thank you for everything that you’ve been through, because of you my life is so much brighter and my load is that much lighter. You are an inspiration and a light shining so brightly, Ann! The friends that I forward your messages to have commented that your angel messages and personal experiences have been so helpful, apropos, and inspiring! And you have certainly blessed others, as the workers’ comments made clear! You surely touched each of their souls in some way, and, who knows, that may have been just what one (or more) of them needed to feel guided further on his spiritual journey! Thank you, from the bottom of my heart, for all you do to bring Love, Light, and Blessings into the World! What a gift you have given me!! Words can’t express how completely grateful I am for the reading tonight. It was SPOT ON! I feel C. all around me and I feel almost giddy about how excited I am to have made such a beautiful, loving connection with him. It answered all my questions and I feel totally and completely relieved about everything. I’m SO relieved!! Ann, you are an angel. I can’t thank you enough for making room in your schedule for me. I feel such enormous, deep gratitude to you. There really aren’t words to thank you enough for the gift you have given me. I don’t know how I can ever repay you. What you have given me is the most wonderful, priceless gift anyone could ask for.Thank you from the bottom of my heart. Many, many thanks and blessings. I have your CD’s Manifesting in the Flow of Grace, in my car. I laugh and love the inspiration that comes through you to me everyday. Thank you for making a difference in my life. You are an ANGEL. I can’t thank you enough. The reading was a beautiful experience and so very beneficial for me. You have an incredible spirit and gift. Thank you for sharing it with me. I hope to see you again soon. Dear Sweet Angel Ann, Once again thank you so much for being a part of my life and helping me through the most difficult time in my life I have ever experienced. Thanks to you I am more at peace and the electricity has returned to normal. Thank you for your time today. I feel so much stronger just seeing you. Thanks to you and your gift I actually believe in myself now and my Life to get through this. I am hurt and sad but I understand what I must do to live a life of happiness. Thank you. I am blessed to have access to such a phenomenal person! Just a quick note to say thank you for the wonderful experience at your workshop on Saturday. The energy was amazing, the people wonderful and the connection to spirit felt like home. I gave the workshop as a birthday gift to my friend, she said it was the best birthday present ever! I just wanted to write and say thank you for your wonderful Manifesting in the Flow of Divine Grace CD! I needed something to listen to while I was driving, and I decided to download your playshop. The first day I listened, traveling along the freeway, it opened something up inside of me that is still going strong. It was just the right message at the perfect time and I have been floating along ever since. I can’t remember how I even found your site, but I am so glad that I did. Now I’m listening to Aura Hygiene, and I’m finding that wonderful too. I just had to write and share my gratitude.Thank you! Thank you! Thank you! I just wanted to thank you for the session with David yesterday. It was transformational. He is happier and feel great relief. He also didn’t use oxygen all day after your session. I am truly grateful!!! It is always so wonderful to see you! I just want to give you an extra special thanks for being so kind and patient today with the kids – you taking the time to listen to their questions and give such great guidance meant the world to all of us. I learn so much from these kids and am so thankful when I encounter others who also honor the kid in a kid and show them such respect. Thank you a million times over for a special day! I believe with all my heart that this, along with a few other things, are the next chapter of your journey. I am humbled and amazed to be a witness to this event. I have said it before, your heart, love, joy, healing, well all that you are is a gift to the world and too me. You have blessed me and so many others with the love you so freely share. If I can even hold a tenth of the love you do, I will be over joyed. God is most certainly guiding your path, just as he is mine. I’m glad you enjoyed the video, it touched me so deeply I just had to share it. Keep shining your light into the darkness dear Ann, it is one of your greatest gifts. Love you so very much, God Bless all your efforts a thousand fold. Oh, Ann, thank you! As always, it was such a delight to get together. Our meeting today was incredible, and I’ve already listened to my CD again tonight.. amazing. You’ve helped me put things into perspective, or proper order. I had the most glorious experience this morning…powerful! In the morning I love to sit outside and breathe in the essence of the day…this morning, I noted the sun was rising and while I certainly could not gaze into the sun, I noted the light that was coming from the sun was the same light that came through your eyes. I simply closed my eyes, faced the sunrise and felt the glory of God flowing to me in that same crystalline light. My heart filled to overflowing, tears flooded my eyes…tears of joy that is… and in the moment I was the heart of God… it was the same light that came through you! As I sat in reflection, it came to me that the Light of God is always shining on us whether there are clouds or moon, as the sun is always there, God is always there shining brilliant LOVE and LIGHT on us. I was so overwhelmed with appreciation, deLIGHT, and LOVE. Glorious. I had to share and thank you for showing me that LIGHT and knowing what to look for and how it feels in my body as it enters every cell and shines in absolute amazing DIVINITY! THANK YOU! Thank you ever so much Ann for the time spent today…..my heart feels settled and I feel as though I now know which path to blaze! I am grateful that I was able to spend time with you…so very grateful! I say this all the time but I just don’t know where I would be without you… My reading today lifted a huge weight off my shoulders and, even though I know I have a lot of work ahead to process everything, I also know I have very powerful support walking beside me. I know God is beside me because you are in my life. How do I find the words to thank you for that? I hope that when you look back on whatever you went through to be in the place you are today, realize that the gift you gave yourself is a light that has touched me over and over since the time I first heard your voice, and who knows who I may go on to touch because you saved me. Who knows how many lives will be lit up because you made the decision to choose the path of your most authentic self and to share that truth so unselfishly. I know enough to know you didn’t pick an easy path, just the only path possible for someone with as pure a heart as you. I am so peaceful tonight because I am so filled with gratitude for you. My words can still only fall short, but God bless you always, Ann, you are so, so deeply loved and appreciated. I’ve been meaning to write to you for a while now. I just wanted to say how much I appreciate your weekly messages. I’ve been getting them for several years now and they’ve been very meaningful for me. It is such a joy to be able experience through your honesty how God is working in the “real” world with a “regular” person. In reading about your personal walk with God and the Angles I feel as though I’m glimpsing a spiritual diary. Please don’t take this the wrong way, but its almost as if I’m watching a Saint in the making. After all, what is a Saint if not someone who is choosing to walk closely with God every day. You are giving the world a great gift. Thank you! Thank you for a wonderful experience yesterday. The workshop was amazing. I am still processing much of what I learned from the workshop and believe I have some new powerful, spiritual tools to use in the future. I just wanted to thank you. I’ve had a rough few days. Today while I was cleaning I decided to put on the recordings of our readings in AZ and listen as a reminder of what peace feels like, and sure enough! Your words are magic. I thank you so much for the light and peace you bring to my life. You are a great gift for so many. I wish you kind reminders when you need them, love that leaves you replenished, and anything and everything good imaginable for you to blossom into. Thank you. Thank you. Thank you. YOU are amazing! Of course, we already knew that. The seminar was outstanding. I really did sense the presence of Michael and Raphael. The people were really blessed and had miraculous experiences. You are a BIG gift to the world Ann. I can’t thank you enough. Please know that you, your ministry, and your TV shows will continue to be in my thoughts and prayers. I really appreciated you having all 5 of us at such short notice. Mom and C. couldn’t stop talking about it over dinner, you gave them a great gift. Thank you. After reading “Love is a River,” I purchased three more copies for gifts. Love is the River is a must read for all who venture into discovering more about their spiritual ‘selves’ and for those who have a thirst for a better understanding of Love in the human experience. I recommend this book to everyone I talk to. I am reading it for the second time, after having just finished it yesterday. So much wisdom to digest! This book is a must-have in everyone’s personal library. I read Bridging the Gap and I am at a loss for words. I have been searching for your book my entire life. I plan to read it several more times. I know we have lessons along our path, but how I wish I had that book when I was younger. It really is the best book I’ve ever read. Ann Albers is an artist of emotions and spirit, & her canvas is her enthralling book. You will feel the stirring of deep memories & even experience healing, as you share Ann’s spiritual journey in the pages of this book. This (Whispers of the Spirit) is not the book I expected. It exceeded all my expectations. Ms. Albers touches on subjects most of us would be unwilling to expose in ourselves. She does it with such grace, insight and sensitivity, yet with undeniable honesty. If you are struggling with self-worth, professional anxiety, and general lack of happiness this book could help you work through it all. I just wanted to say thank you so much for an amazing class. You are an exceptional speaker. It was incredible, the energy in the room and the information that was shared by you and everyone else. I feel that I left there with so much love and insight. What a wonderful day we had !! You are terrific! Thank you sooo much for sharing your Blessed experience with us! I just wanted to say what a pleasure it was to meet you yesterday at “Dancing With Angels!” I loved the workshop! Thank you for all the wonderful work you do! The “Dancing with Angels” workshop this past weekend was truly wonderful! I want to again say “Thank You” for your wonderful Playshop Saturday! It was great on so many levels. There’s so much I could say, but I want to keep this succinct. In that regard.. Mahalo! You indeed walk in “both” worlds, as an Etheric Angel and as an Angel on Earth too! I just want to thank you for a fabulous day at your workshop today in Sedona. It was fun, inspiring, enlightening, and an all around amazing day. I enjoyed meeting so many “like-minded” wonderful gals, and your stories were funny, enjoyable and touching. I had no idea what to expect, I just knew I was going with an open mind and heart, and just let the rest “be”. All very powerful! You were so amazing… You had everyone laughing, and you are so dynamic on stage… There was a powerful healing there that took place, something that was very unexpected. The work that you do touches so many lives in ways that you will never know. I attended your workshop in Sedona and was blown away. It was great, thank you so much!! I cannot thank you enough for the life-altering workshop in which you presented over the weekend in Sedona. It made me realize how powerful and truly loved we really are! Miracles can really be apart of our daily lives! I just wanted to say thank you so much for an amazing class Saturday. You are an exceptional speaker. It was incredible, the energy in the room and the information that was shared by you and everyone else. I feel that I left there with so much love and insight. Hi Ann!!! Tears of joy!!! I am so humbled. God rocks!!! J. called me earlier. She had gone over Z’s X-rays from this morning with her doctor and a miracle has happened!! The upper lobe of her left lung is now over 50% open and the mucus that was holding it closed and occluded is almost completely gone! It was really serious and the worse it had been Tuesday. I wanted to say thank you to you and shout up a praise. Woohoo God rules among chaos and heals to His glory!!! Please continue to pray and pray for her lung functional tests tomorrow be in the upper 90’s percentile. Warmest regards. Ann – I’ve been in a blissful state since our session Friday. Thank you again for your ever-present and always powerful support, guidance, and inspiration. Ann while I was reading this I began to roast myself and I feel very fuzzy. I cannot feel any hip pain at the moment either. I am like on fire and can feel energy soaring through my body… I am working tomorrow from 10:00 until 6:30 I will let you know how it goes during the day when I get a minute to check in.. Simply Amazing you are!! Ann, my daughter is doing much, much better!! Thank you for your ability. Just so you know, that the week you responded to my email about sending healing love to help with my husband’s cancer condition things began to improve almost immediately. I have been so busy I haven’t had a minute to tell this to you. Thank you!! My dog with cancer is feeling much much better- she ate all of her dinner and her medicine and did a little play bow with our other dog. Thank you dear Dear one. God smiles through you. Thank you for the energy! I slept like a baby for the first time in months! I did get super hot and almost nauseous I was so warm about the time I was getting ready for bed. I seriously have not slept like that or even that many hours in months! And thanks for accepting L. as a client… He was blown away with your reading and the energy work you did for him. After loosing his partner of 43yrs, your reading was exactly what his sweet soul needed. Thank you. Thank you so much, Ann, for such an extraordinary day in so many ways!!! I’m the person with cancer you did the gazing with at the end. I feel amazing this morning, and will keep you posted as to my healing. With much love & gratitude! Ann: I’m not really sure where to begin other than with a huge thank you for coming in to my life when I needed you most. My oldest brother wants me to share my experience with you during the meditation/energy piece with my nephew who is a film maker. Thank you and your angels and my parents angels for everything. Their love and your love gave me so much today. My knees are almost completely healed thanks to your gazing. Wow, I went to bed Ann and whatever you did I have not slept so well I cannot remember when I had sleep like that. I woke up quite at peace and balanced. My headache and neck pain is gone. God Bless you. I was able to get to work very early. You are awesome, and I love you very much, many thanks and blessing to you my friend. So much has happened in the last 48 hours. I walked out of your house feeling 100% better physically and emotionally. This whole last week [I was sot tired] I have been working 1/2 days and going to the doctor. After I left you I had so much energy I went out with some friends and went kayaking to watch the meteor showers! So good to see you today! I was in heaven all day so thank you for the gazing session at the end!! 🙂 Thank you again for all your guidance and help I AM blessed!! I could hardly look at you the other day – your light was so bright that it hurt my physical eyes and I had to look away several times when you were doing the gaze with me. You were pure gold and so bright it was like looking at the sun – you appeared like a photograph negative – a super bright gold outline without any features in it… What a glorious sight to behold. Today was the best day I have ever had in my entire life! I felt more alive than I maybe ever have in my life – I was filled to overflowing with happiness and for no reason – it was just there bubbling out. I had a new attitude at [physical] therapy and it went better than I could have expected… I’m allowing the abundance of God’s love into my heart and my life now. I have no outside reason for this, but I’m actually feeling loved and now I can celebrate others who allow God’s love as well. I don’t want to put a jinx on it, but this morning I walked 2+ miles with minimal and then no pain from my sciatica! Ann, thank for all the love and healing energy that you share. Earlier this week I asked you to keep my family in your prayers. In particular I was hoping that your energy would reach my son. He has been experiencing depression for about 6 months and has had no energy or interest in life. Over the last 2 days I have seen a dramatic change in him. He has been smiling, going out with friends, and enthusiastically planning for the future. I have not seen this side of him in so long! Thank you, thank you, thank you, for your love. You change so many people’s lives! I just wanted to take a minute and thank you for the wonderful day Saturday (Be-Lightful). I had so much fun. You are truly a angel. I learned so much and I am visualizing everyday. It was my friend’s first time at something like this and she fell in love with it. She is going through a hard time and needed that day. I could listen to you all day, you are so so funny, and make it so simple. Thanks again for being you. I just want to thank you from the bottom of my heart for the session yesterday. You are an awesome person with an incredible gift, and your guidance meant more to me than I could ever describe! I couldn’t wait for my husband to get home yesterday to tell him all about it, and he was so happy to see me so happy! Also, being able to physically connect with my Mom was such a beautiful experience that I will never forget! Your workshop on self love was awesome! So much divine wisdom, laughter, and so many tears of joy. The hardest part of your workshops for me is the next day which always feels like the day after Christman. I have attended many workshops but none lift my spirits the way yours do.You are such a blessing to the world. How wonderful for us that you chose to be an angel in this lifetime and guide so many of us. Thank you for all you are and all you do. Thank you so much! You have showed me how to see love in everything! I can not thank you enough for seeing us today, I really think it will be life changing for me. Thank you, thank you, thank you! Hi Ann, I wanted to send you a note to tell you how much your book is blessing my mother. She called me this morning and I could sense such a lift in her spirit. She was bubbly, reminiscing and singing me old songs that your book kept reminding her of, like “I’ve Got A River of Life Flowing All Through Me, And another one about the joy bubbling through her soul.” She said that she stayed up and read your book cover to cover in one night and then went back to start going through it a second time more slowly, doing the exercises.Within minutes of our conversation, I was feeling those same lighthearted, bubbly sensations deeply within. A joy and sense of playfulness surrounded us. What had started out to be a not-so-good (stress-filled) day for me, had completely shifted and both our spirits were significantly lifted. Mom was telling me that she didn’t know why, but when she opened your book and read the note that you had written to her, she began to cry. Mom said that she didn’t understand it, but that there was just something so special and personal there, that it immediately brought tears to her eyes. She was telling me all about the sights, and images that were coming to her when she did the breathing exercises with such enthusiasm! It really did my heart good to see her like this. I read your inspiration every week and always look forward to it. You put yourself “out there” for all of us to look at our own lives and be and do the best we can. I can’t express how grateful I am for you and all your work. I ordered your CD set on Magical Self Love. I LOVED IT. It literally changed my life. I had been searching for the answer for loving myself for years and years, and your CD’s gave me what I needed to know and so much more! I cannot ever thank you and the angels enough for the gifts and blessings I felt and received. My mom called me eariler and was just beside herself. Your session today has brought her such joy and finally, some peace. She shared a few of the enlightenments that came in her session today and it just sounded remarkable. All I have wanted for her is to find some peace in the face of my sister’s death and I think she may finally have it. Thank you, THANK YOU…..for making the time for her. It has been a blessing to our family in more ways than you know. Dear Ann, I saw you at the Celebrate Your Life conference and wanted to let you know how much I enjoyed your lecture and have LOVED reading Love Is The River. It will be my Christmas gift to many of my friends! Just wanted you to know how uplifting, informative, and accurate your reading was that you gave me on Thursday. I came away with great clarity and joy. I appreciate that you were able to squeeze me in on your cancelation list. What a joyous gift you have – thank you for sharing it! You are a true earth angel! I am so touched with your kindness. It is the love, light, healing, wisdom and joy that you so willingly share from your conversations with the Angels that have helped me get to this point on my journey. The weekly stories that are real, human, honest and filled with lessons learned that you share with us, each week always seem to be right on point with what I am going through and my friends, too. So to you Ann, “Thank you, and may God keep you and bless always”. You are truly a LIGHT to so many of us. One of my most dearest friends, came to you today regarding her son who died last month at the age of 21. She and I have been close friends for over 22 years and I was with her the day he was born and the day he died. YOU HELPED HER SO MUCH! I prayed for him to be able to chat with her today as did she, and boy did he ever come through! LOL. So, thank you for all you do Ann. It’s so valued and appreciated. All sessions with you are always very special but what you communicated to me today about my father truly filled my heart in a way that I can’t explain. Thank you so very much. I wanted to thank you for the wonderful session you did for my mom on Tuesday. She has done well with my dad’s passing, but after your session, she was doing great! You did a fantastic job on your interview with George Noory on Coast to Coast. I stayed up to listen to the entire interview and it was terrific! It was very much like a conversation and you were you… absolutely genuine, which was the best of all! You handled the caller with the heresy problem just beautifully, which sooo much grace. Keep shining the light and doing the great inspirational work…. you are very much appreciated! Hi Ann, I just had to write to you this morning and say how totally awesome you were on Coast to Coast last night. I especially loved all the analogies you used to explain the things you were speaking of. I just thoroughly enjoyed it and didn’t even mind the am hour ! I thought you were brilliant – human and so REAL. The way you responded to the man who called in about your walking a thin line was with love as of course you would do. I think George Noory really enjoyed talking to you also! I am listening to coast to coast right now. When you said, “Listen to every message no matter how small”, I had to get on your site and this is the first time I have learned of you. What a beautiful site, everything so simply stated and profound. Honestly, the most beautiful site of this type I have seen. It is like an “angels on earth” site. Hey Ann! I am listening to your show and you are doing SO awesome! You’re so informative and have such a great way of putting things. Ann, I so have to thank you (and my angels) for the advice I got from them last week. I had asked what to do about my teenaged daughter, who seemed to be sort of keeping me at bay, and not really communicating with me. And blowing hot and cold with me. The angels told me to put it directly to her – to tell her I realize she doesn’t need or want much mothering any more and I’m trying to adjust our relationship to be more of a friend than a mother, but without making her feel “neglected.” And to ask for her help in telling me what she wanted and when she wanted mothering and when not. Well I took her out to dinner tonight and I said just that, in the midst of her being her crabby self. And it WORKED!! Her attitude and demeanor changed immediately, and she said she felt ready to have that kind of change in our relationship! and she started talking to me!!! And I told her how proud I was of the way she is growing up and making good judgments and keeping her feet firmly on the ground… It was wonderful!! so, THANK YOU! You make such a positive difference in so many people’s lives. I just thought you should know. I’m really grateful to have you in my life. I recently purchased and dowloaded the file – In search of the Holy Male (Female). I was in shock and awe of the message you delivered. I am a gay man who recently met and dated a guy who I developed some very strong feelings for… Now I understand why he was put in my life and why he is now gone. It was a brief interlude but an intense one of learning. Above all I know I need to take care of myself and love me. Thank you Ann! Ann’s messages have been invaluable to me through the years, particularly when my son (born with a heart condition) was about to come into this world. She has brought me both comfort and hope, and I feel lucky to have met her. I just want to thank you for the excellent workshop on Sat.! You did a fine job and I learned a great deal and was able to start applying it immediately! I had not been feeling well prior to the workshop, but I actually improved a lot during the workshop, so I knew that there was lots of healing energy around! I just finished your meditation. Oh, what a peaceful state I’m in right now. Your voice is like velvet and sooooo soothing. I never felt this relaxed with other tapes I’ve had in the past. Thank you so much for your gift of love, and healing. Another brilliant and beautiful message! I absolutely love what you are bringing forth these days, and the extra step of practical application steps to help clarify what might seem like abstract concepts. Thank you! I attended your workshop on Saturday and still am floating from that. I can’t begin to tell you how moved and filled with divine love I feel. Your gazing did something to me I can’t even describe. I just know that when you first started and when you were gazing toward me something rose in me and caught in my throat almost making me sob. I’m wondering if something was healing. And the love I felt and continue to feel must be heaven. I am so grateful. Thank you for visiting me here at Visions of Heaven. If my work, words, or products have helped you please share a testimonial so others can benefit as well. Your words and your hearts touch mine and motivate me to keep serving in ever-expanding ways. May the light that you are bless and illuminate your path. You are a blessing to the world and in my life! I understand & accept that when I submit a testimonial I grant Ann Albers permission to use it and/or my name on the site, in marketing and promotional materials, videos, or other media, in our newsletter, classes, online programs, products etc., unless I indicate otherwise.